Photo File – Desert Rose: Antonov An-132D UR-EXK | Achtung, Skyhawk! When aviation people mention Paris and its bi-annual air show, the first things that come to mind are often striking Boeings and fancy Airbuses, huge orders and major exclusives, big names and game-changing events. For the show’s 2017 iteration however, the Paris that had grabbed my attention the most was a bit more… utilitarian, with a wish list dominated by freighters, regional jets, light aircraft (duh) – and the Western premiere of the An-132D, Antonov’s freshly reborn An-32 tactical transporter 🙂 . A profile only Mama Antonov could love. Even though it was always a supremely capable aircraft, the original 32 was never really a looker. With its mismatched Ukrainian airframe, Chinese-style nose and Commonwealth powerplant, the 132 continues the trend in style! 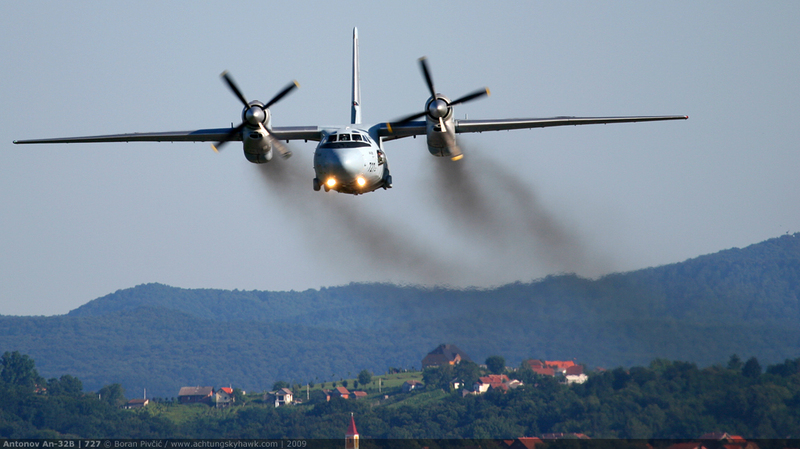 A tough, no-nonsense airlifter of the old school, the original An-32 was developed in the mid-70s from the much more common An-26, and intended primarily for operation in hot-and-high environments – particularly Himalayan India, at whose behest it was created in the first place. Whereas the regular cold-and-low An-26 did just fine with its twin 2,820 HP Ivčenko AI-24VT engines, the greatly reduced air density at altitude (and the consequent loss of power) had necessitated a bit of a rethink, resulting in the decision to use the older – but significantly more powerful – AI-20M unit out of the An-12, developing a juicy 4,250 HP at sea level*. * even though it would end up doing just that, the idea behind this power increase was not to make the 32 outperform the 26 in normal operation – but to make it perform within reasonable expectations out of airfields at elevations as high as 15,000 ft. At these sorts of altitudes, the air density would drop to such levels that the AI-20 would only be able to generate the same sort of power as the AI-24 did at lower levels – making the 32, in theory, behave somewhat like an overloaded 26 would at its optimal altitude. Even more demanding was the Indian request that the aircraft be able to maintain 20,000 ft on one engine fully loaded – a requirement that no aircraft of that type had until then been able to achieve. Since propeller/engine combinations are not really open to experimentation, the selection of the AI-20M had automatically included its AV-62I propeller, at 4.5 meters in span noticeably bigger than the 3.9 meter AV-72T bundled with the AI-24. Apart from the obvious problem of reduced propeller ground clearance when operating “off road”, the size of the 62 had also dangerously reduced the gap between the prop tips and the fuselage, leading to the expeditious solution of simply relocating the engines to the upper surface of the wing – thus giving the 32 its distinctive (and somewhat unwieldy) look. The (now demobbed) fleet of the Croatian AF rolling in after a formation flight. As can be seen, the primary goal of moving the engines higher up was to create extra space for the props due to the curve of the upper fuselage, thus avoiding the structural and aerodynamic headaches of having to move the engines further out – as well as efficiency shortfalls should propeller span be significantly reduced. However, while all of this looked peachy on paper – and flew nicely in the Ukrainian lowlands – up in the mountains serious problems had quickly started to emerge. Even though the AI-20M represented a 51% increase in sea-level power for a comparatively small increase in weight, early test runs in the Himalayas had shown it to be woefully inadequate, with the prototype almost coming to harm during a high-weight, high-altitude take off in windy conditions. 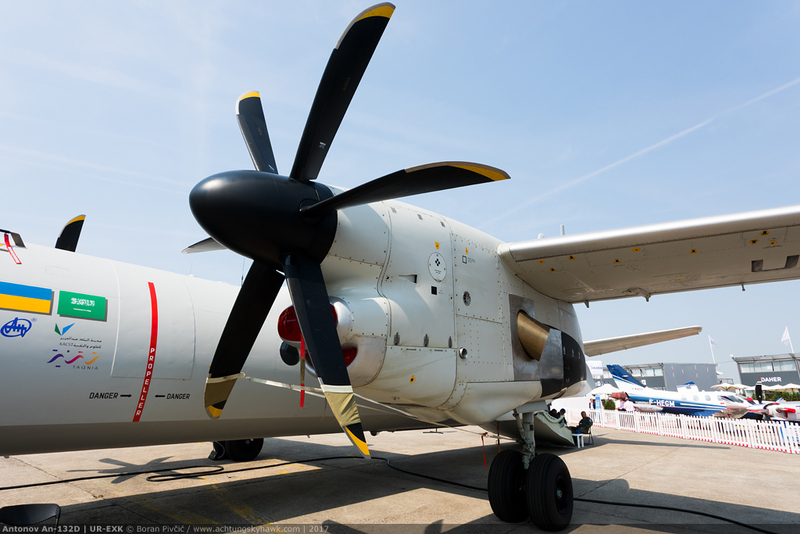 To keep the Indian Government – the 32’s only customer – on side, Antonov had decided to up the power after just a few flights, opting for the 5,180 HP** AI-20DM and 5.1 meter AV-68DM prop used on the An-8. The latter had created yet more bother for the engineering team, since the additional span had once again reduced fuselage clearance to uncomfortable numbers, requiring the propeller to be trimmed by 40 cm down to a span of 4.7 m.
** it is important to note that the 32’s oft-quoted 5,180 HP was available only as emergency power – and not used in daily driving. In fact, for most of its early life the AI-20DM was in reality a 4,500∼ HP engine, a restriction imposed to extend, as much as possible, its incredibly limited 1,000 hour Time Between Overhauls (TBO) – and a pitiful total service life of just 2,000 hours. But, as Ivčenko engineers beavered away at the design, its longevity began to increase dramatically, allowing that extra power to be occasionally used even in normal operation. Indeed, by the early 2000s, the AI-20D Series 5M engine installed on the improved An-32B-100 could develop 4,750 HP for a TBO of 4,000 hours – and a total service life of a respectable 20,000 hours. The first turboprop to come out of the Ivčenko works, the AI-20 was first run in the mid 1950s – and can likely trace its roots back to German jet engine research in the closing days of WW2. As such, it has always been a powerful – but very crude – unit, well known for its tendency to smoke like mad at higher throttle settings. Honestly, I don’t understand why the Croatian AF had even bothered painting them in low-visibility grey… you could spot them miles out without trying. *** soon after the 32 entered service, it was discovered that the vibrations could be so strong they tended to loosen bolts and cause cracking in fuselage frames in the area of the propellers. The problem was so acute that, from the 32nd example onward, the affected sections had to be specially strengthened right on the production line. Having finally reached its ultimate form by the early 80s, the An-32 would soon begin to encounter a world of unexpected issues. As the first Soviet aircraft designed for export right from the outset, it was in Antonov’s best interest to pitch it to as many foreign customers as it could, especially since the USSR – despite having bankrolled its development – expressed no intention of actually buying them. However, having been tailored to meet the needs of only one customer – India – had meant that the 32 entered into a market fight it was in no way equipped to win. For despite having done everything Antonov had claimed it would do (so much so that it remained the only classic An to stay in production into the 2010s), it was simply too much aircraft – and too specialized – for the vast majority of the world’s operators. Stacked against it were also its tendency to drink like burning oil refinery, while the AI-20 / AV-68 combo was overly loud even by Soviet standards. Then there was the general lack of sophistication in the nose, with the factory-delivered cockpit virtually unchanged from the An-26 – and all of this at a time when glass cockpits in the West were already making their way into light aircraft. And finally, there was the stigma of its origin – and the feeling of dread whenever somebody uttered the words “Soviet after-sales support”. 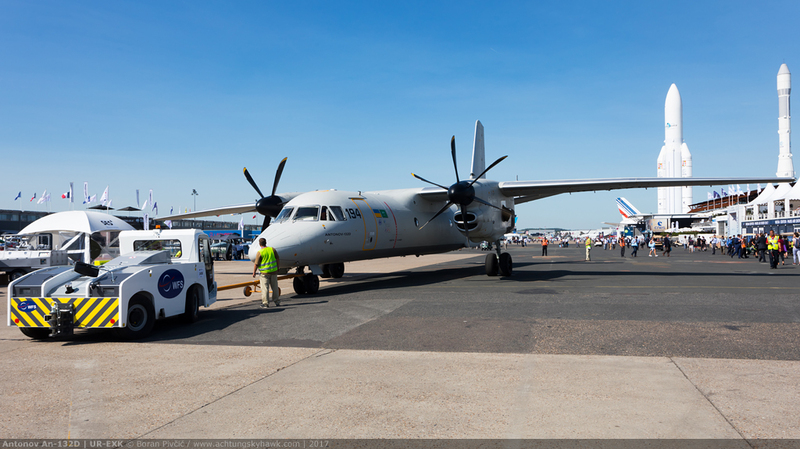 As a consequence, only around 360 would be completed by 2017 – significantly less than the 1,400 An-26s that were on file when its production ended in 1986, despite Antonov’s aggressive marketing both before and after the collapse of the Union. That the inefficient engines and museum-grade equipment were some of the type’s main stumbling blocks had not gone over the heads of the engineers at Antonov, who had – following the end of the USSR – soon began looking into ways of refreshing the 32. Being strapped for cash though – the funding pipelines from Moscow having long gone – had meant that they could only address some of the aircraft’s cheaper issues, starting first of all with the flight deck. Their first crack at it had produced the An-32B-110, equipped with a more modern, two-man cockpit of CIS manufacture – while the follow-on An-32B-120 and An-32B-200 were more of the same, but with a number of Western avionics systems and an integrated electronic communication network to link (most of) them into a unified whole. While this was a very welcome development, the rest of the aircraft was still stuck back in the 70s, which – combined with the Ukraine’s wobbly economic and political situation – meant that there were still no foreign takers to be found. 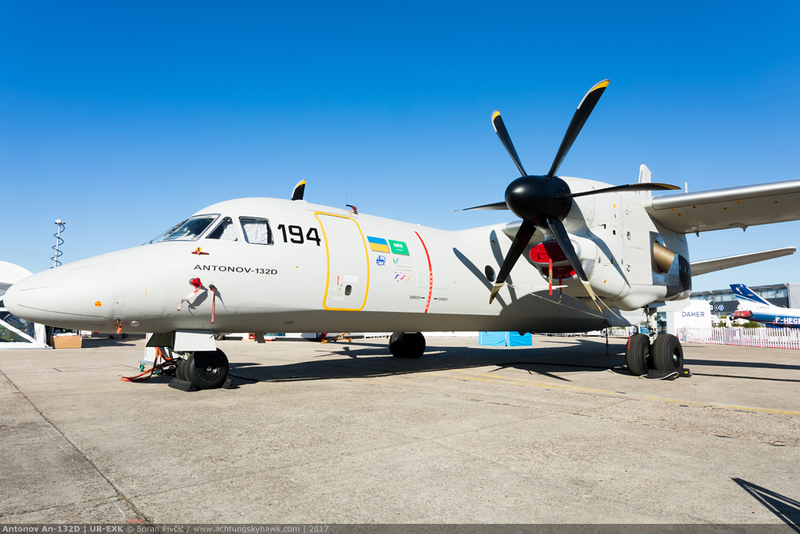 Unable thus to go at it alone, Antonov had eventually started looking for an external partner that could reliably finance a future upgrade project. Even this was fraught with issues, partly due to the country’s instability, partly due to the still dominant Soviet system of design, manufacture and support – and partly because the market was already dominated by competing aircraft such as the C-295 and C-27J, nearly as capable up high, but far easier to live with on a day-to-day basis. Shown to the West for the first time right at Paris, UR-EXK – wearing serial 001 and still the only one of its type in existence – had attracted quite a bit of attention, despite the presence of much eye candy all around. 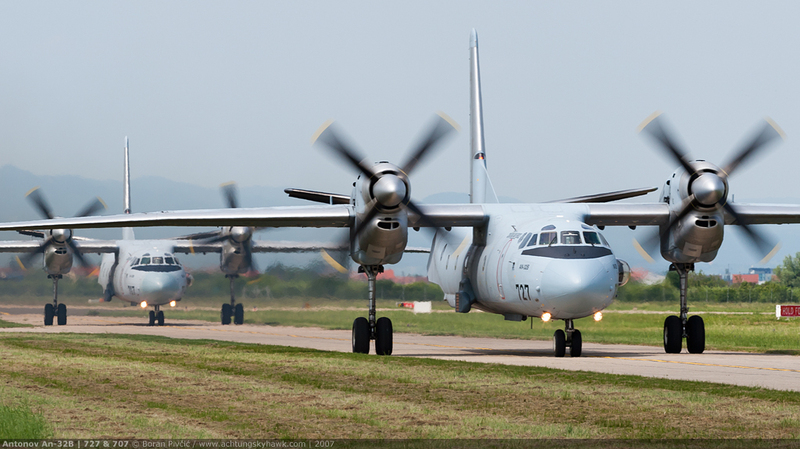 A new-build airframe (as opposed to a conversion of an existing An-32), UR-EXK is scheduled to be used solely for certification purposes – which naturally means that it is not 100% representative inside or out of the aircraft people will actually be able to buy. As it stands now, the 132 is a fascinating smorgasbord of influences from both sides of the former Iron Curtain, making it really hard for the eye to focus on any one thing. For those of us used to the characteristic shape of the legacy An-32, perhaps the biggest “offenders” are the engines, twin Pratt & Whitney Canada PW150A**** units out of the Dash 8 Q400, firing 5,071 HP for take-off – and up to 6,200 HP on firewall power – at their six-blade, 4.1 meter Dowty R408 propellers. **** another nerdy tidbit is that the mighty PW150A is actually a close relation of the tried-and-tested PW100 family out of the ATR and early Dash 8. Originally called the PT7A, the three-spool PW100 uses two centrifugal compressors mounted in series, that on the most common 120 series are good for approximately 2,500 HP. Given that the Q400’s design cruising speeds required quite a bit more poke, P&WC simply took the 120, swapped the front (low pressure) compressor for a more powerful axial model, beefed up the internal structure where needed – and voila, the 5,000+ HP PW150 was born. Apart from now providing a true “everyday” 5,000 HP capability, the new powerplant had also solved one of the 32’s bigger user-friendliness issues, noise and vibration. Like on the Q400, the props now spin at speeds of an idling piston engine, with 1,020 RPM used for take off, 900 for the climb – and just 850 in cruise. Being fully composite (glass fiber reinforced plastic + carbon on the outside, lightweight foam on the inside) each R408 weighs just 252 kg with all the works – while the PW150 itself tips the scales at just 720 kg dry… a significant 360 kg saving per engine over the 1,080 kg of the modern day AI-20K (for comparison, 360 kg in fuel is what each PW150 burns in 40 minutes at Q400 speeds!). The powerplant package is further rounded up by the UTC Aerospace (formerly Hamilton Sundstrand) APS 1000 APU – at 135 kg also significantly lighter than the 180 kg TG-16 starter used on the old 32. However, while the reduction in noise and taming of the 32’s Jet A alcoholism are all very welcome news, the PW150 installation does have one notable drawback – like on the Q400, the maximum allowable altitude for take-off and landing is reduced to 10,000 ft, 5,000 short of what the AI-20s could manage. With a roughly 50 cm shorter span than the AV-68 (and only 20 cm longer than the AV-72 of the An-26), the R408 had allowed the engine to be moved back down below the leading edge of the wing for improved aerodynamics. The exhaust is now vented to the side and downward, eliminating the interference with the horizontal stabilizer that had briefly plagued the 32. Another detail that fails to escape notice is the new “platypus” nose, a design not unlike that of the company’s An-72/74… and more than one Chinese transport come to think of it. While it is hardly flattering to the robust and purposeful lines of the An-32, it is there to accommodate the 132’s brand new weather radar and avionics setup, the latter in the form of a custom-tailored version of Honeywell’s Primus Epic suite – the same system used on the Dassault Falcon 7X, all top-of-the-line Gulfstreams, as well as Embraer’s E2 series of regional jets. Not a bad look I must say! 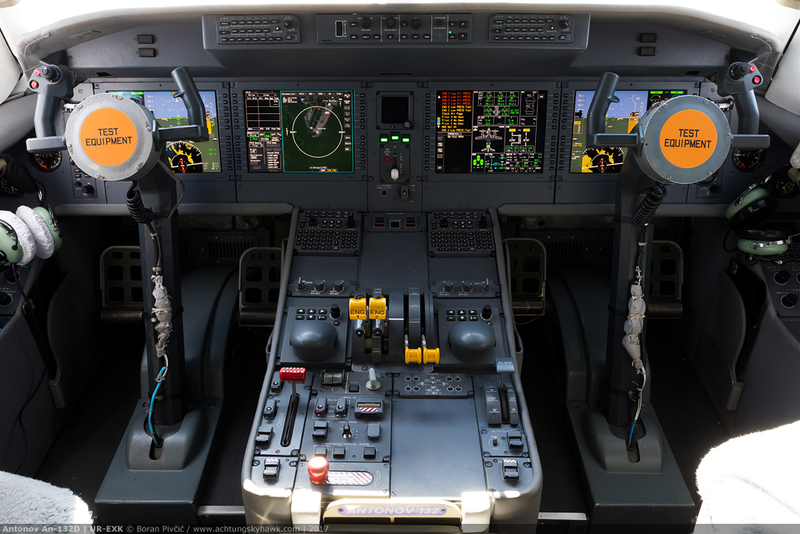 Noticeably less cluttered than the original setup, the Primus Epic installation contains everything you need to fly in modern, congested airspace – and in sophistication and capability rivals pretty much anything found in a modern airliner. Interesting details are the two trackball controllers on either side of the throttle quadrant – used to control most of the system’s function via an on-screen cursor – and the presence of a long-range HF radio as standard, an indication that the 132 is still meant to be flown “off the beaten path”. … all of which compares favorably – from an operational perspective at least – to the original three-man setup. One of the key issues of the 32’s flight deck was its closed architecture, making it costly and complicated to integrate many non-Soviet systems (especially on smaller, cost-sensitive aircraft such as this). 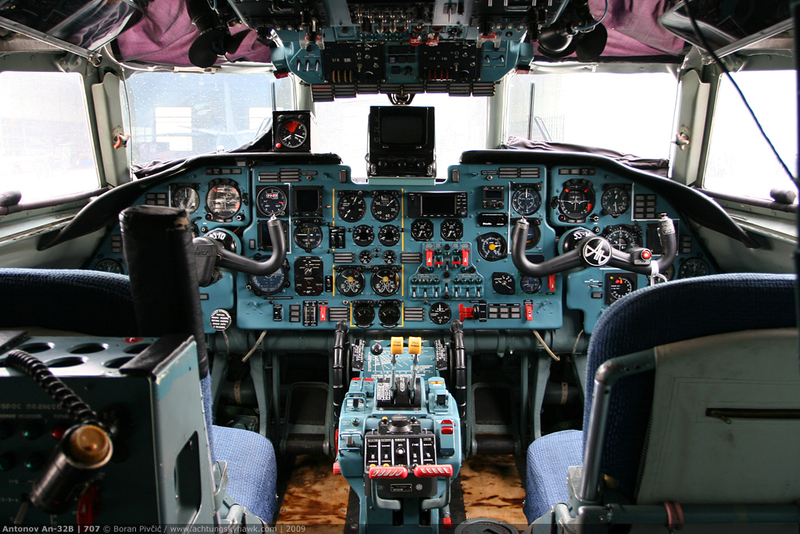 For operators outside the Eastern Bloc, changes to the cockpit were thus limited only to the absolute necessities needed to operate in Western airspace, such as a modern Mode C/S transponder, TCAS system and the occasional basic GPS unit (like here). 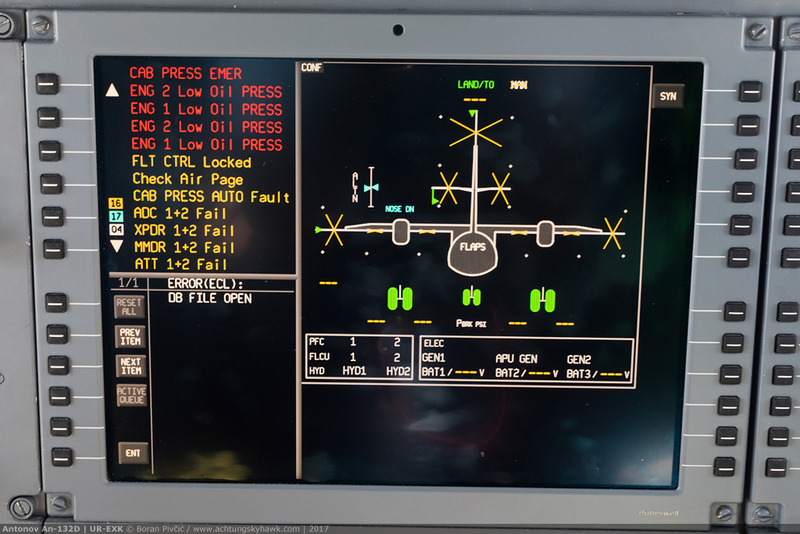 The new setup also includes digital representations of just about any system installed on board; the only analogue indicators on the main panel were an old style AOA indicator and G meter, installed mainly for flight test purposes. The MFDs can also display interactive airport maps, further simplifying operations on complicated and busy airports – thus allowing the 132 easier access to places few 32s could visit on a regular basis. An overhead panel that was once hard to imagine in a Soviet aircraft. Like all modern layouts, this one also follows the so-called “dark cockpit” concept, in which normal system operation is indicated by the ABSENCE of any switchlight illumination. 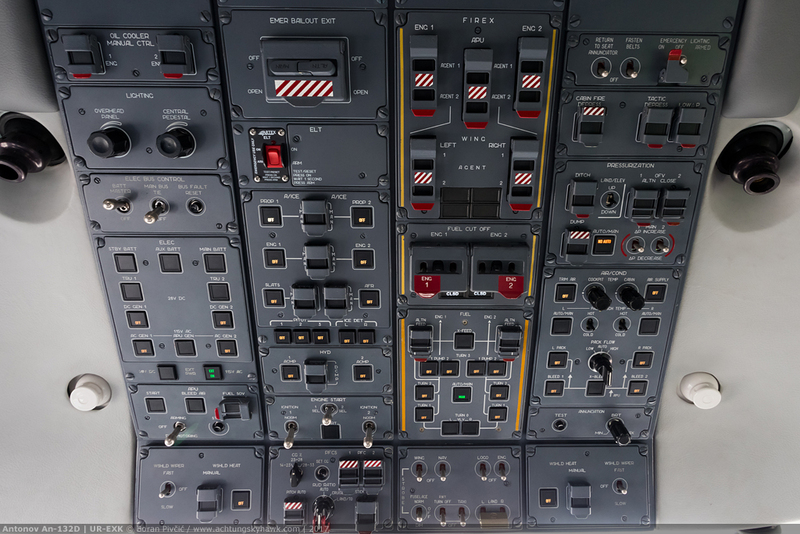 While this makes the cockpit duller from a photographer’s perspective, it reaps huge benefits in actual operations, since the crew can now quickly scan the panel for any issues without having to verify the status of each group of switches – if nothing is illuminated, you’re good to go! As well as making life in the pointy end far easier, the new avionics setup also has a couple of additional beneficial side effects by way of removing the navigator and his/her bulky work station. The lesser of these is the new entry door on the left side (w/ proper integrated stairs); but the more useful one is a bit more space in the hold, which now measures 13.45 m from the front bulkhead to the cargo door and equates to a floor surface of 32.3 m squared – up from the 32’s 12.48 m and 30 m2 respectively. While this increase doesn’t sound like something to write home about, when operating with critical cargo and/or in critical conditions, it can make all the difference in the world! Unlike the 32 – which in Soviet times was always sold pretty much solely in a single multi-purpose configuration – the 132 offers several interior and equipment options for specific missions. These range from common bulk transport + paratroop and medical layouts to the more exotic maritime patrol, surveillance, jamming and even firefighting and gunship***** configurations. ***** while using the An-132 as a firefighting aircraft may sound outlandish, the precedent had already been set by the An-32P Firekiller, the only variant of the original 32 to remain in production into the 21st century (as mentioned previously). First flown in 1995, the P carries up to eight tons of fire retardant in two conformal tanks on either side of the fuselage, the same setup as employed on firefighting versions of the British Aerospace 146 – as well as the Q400 firebomber used by the French S écurité Civile. Turning a medium transport into a low-cost gun platform is also not a novel idea. Forgetting for a moment the very first proper transport gunship – the Vietnam-era AC-47 Spooky – this concept had already been revived several years ago by the MC-27J, a standard C-27J modified with a modular cargo loading system that can accept a remotely operated GAU-23 Bushmaster II 30 mm cannon firing through the left rear door. Of course, all of the above would be quite moot if the 132 did not also come with a brand new set of performance figures. As displayed at Paris, UR-EXK is actually a D model (dalniy, long range) that boasts a 3,600 km range with a six ton payload – a lot up from Grandpa 32’s 1,600 km with a five ton load (though most of this difference is down to a drop in fuel consumption rather than a large increase in fuel capacity). This newly found carrying capability is also reflected in absolute numbers, with Antonov quoting 9.2 tons for maximum payload – a 37% increase over the 32’s 6.7 tons. The extra power and efficiency of the PW150 / R408 combo is evident elsewhere as well, for despite being 4.5 tons “fatter” than the 32 – 31.5 vs 27 tons at MTOW – the 132 has pretty much the same ceiling, 27,000 ft against the original’s 26,500. But perhaps the most important step up is in the way the 132 is built and maintained. Like many Soviet aircraft and systems of the period (cough… AI-20DM… cough), the 32’s service life was… unimpressive at best, standing at just 16,000 flight hours and 8,000 landings – the very reason why many, including those of the Croatian Air Force, had been nowadays withdrawn from service. Antonov had clearly taken note of this issue, since the 132 is now cleared for a respectable 50,000 flight hours and 30,000 landings – or 50 calendar years, whichever comes first. 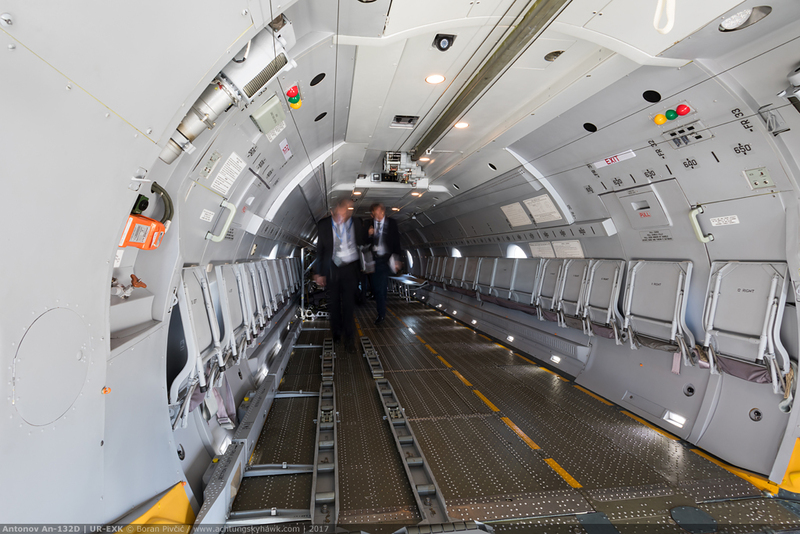 Maintenance schedules are now also much closer to the sort of numbers seen in the West, with the so-called “C check” – one below a complete disassembly of the aircraft – scheduled every 6,000 flight hours, compared to 8,000 for the equivalently sized Q400. More frequent checks – such as the “A check” – are still not that great, with 400 flight hours quoted versus the Q400’s 800.